Find typo? Help fix it. 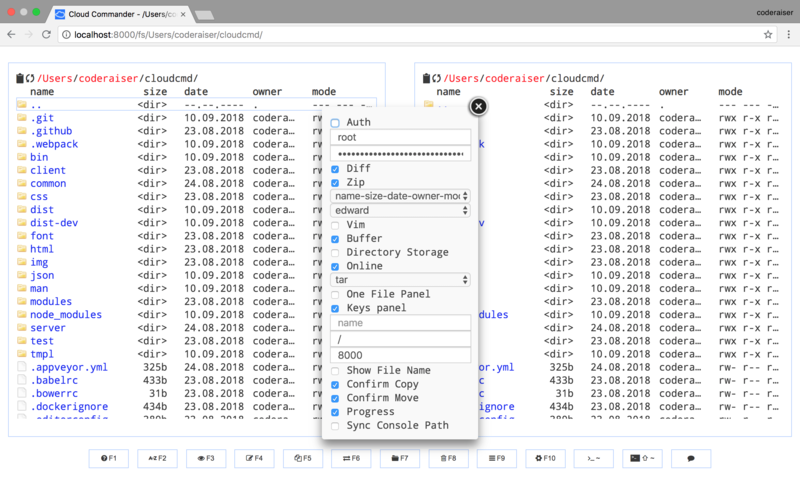 Cloud Commander is a file manager for the web. It includes a command-line console and a text editor. 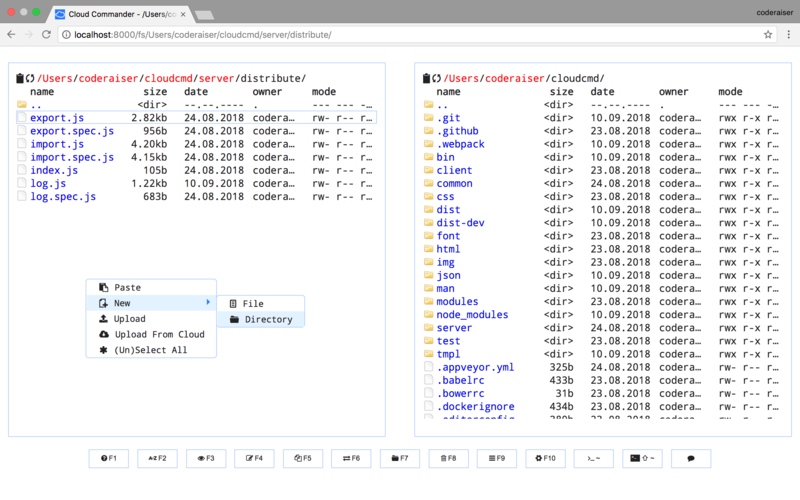 Cloud Commander helps you manage your server and work with files, directories and programs in a web browser from any computer, mobile or tablet. Client works in a web browser. Server works on Windows, Linux, Mac OS and Android (with help of Termux). 3 built-in editors with support of syntax highlighting: Dword, Edward and Deepword. 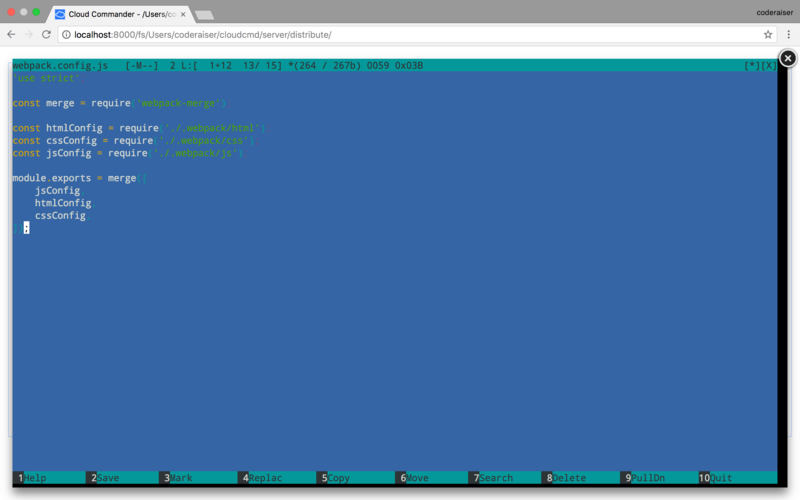 Console with support of the default OS command line. Built-in archives pack: zip and tar.gz. Built-in archives extract: zip, tar, gz, bz2, .tar.gz and .tar.bz2 (with help of inly). 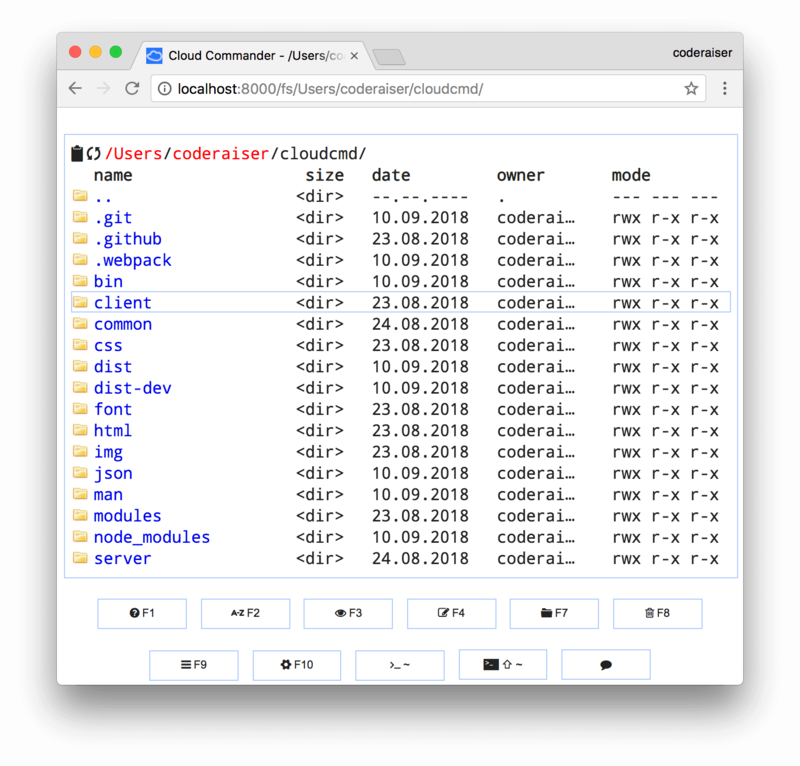 For options not specified by command-line parameters, Cloud Commander then reads configuration data from ~/.cloudcmd.json. It uses port 8000 by default. Then, start the server again with cloudcmd and reload the page. These file operations are accessible with “drag and drop”. For more details see Edward hotkeys. For more details see console hot keys. 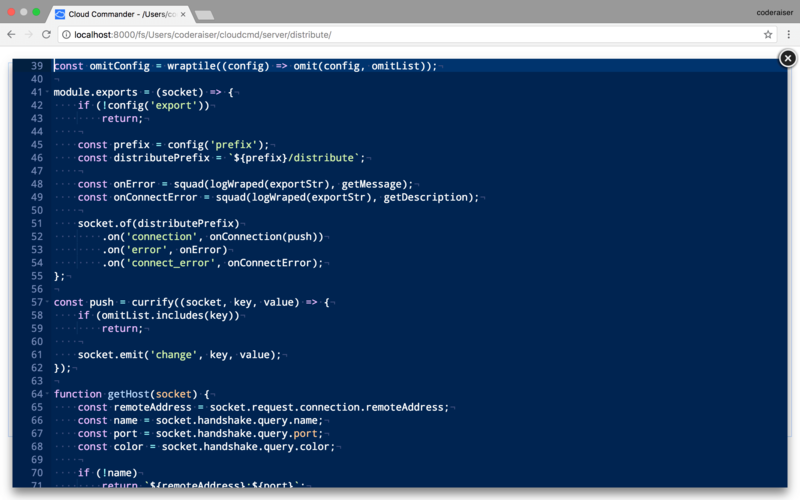 cloudcmd --save --terminal --terminal-path "C:\Users\coderaiser\AppData\Roaming\npm\node_modules\gritty"
After that, you can use Cloud Commander’s terminal in the same way as a normal shell console. "editor"                : "edward", // default, could be "dword" or "edward"
"packer"                : "tar",    // default, could be "tar" or "zip"
Being able to configure Cloud Commander remotely opens the doors to using it as microservice, and that’s what the “distribute” options set out to do. There is an export server and an import client, which are enabled with --export and --import respectively. There is a “token”, which should be the same in --import-token and --export-token. To use the import client, you should provide --import-url to the client so it can connect to an export server. When the import client uses --import-listen, a persistent connection is used, and the client receives live updates from the import server. 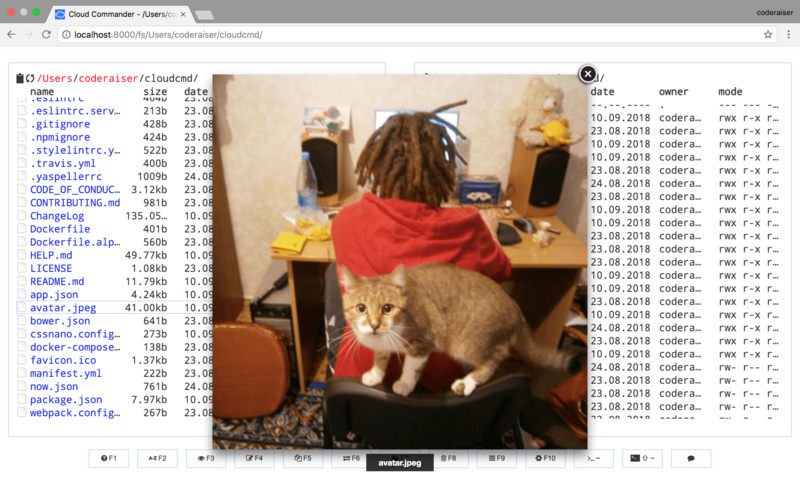 Cloud Commander can work in one panel mode when your screen size can’t accommodate a second panel (such as on mobile or tablet), or via the --one-file-panel options flag. If you want to enable authorization, you can pass credentials to Cloud Commander with a config. To generate a password, you can install criton with npm i criton --save, and use it (or any other way) to generate a hash of a password. Just run shell/addtables.sh for default options. If you would want to get things back just clear rules (rule numbers 1 and 2; in your list they could differ). 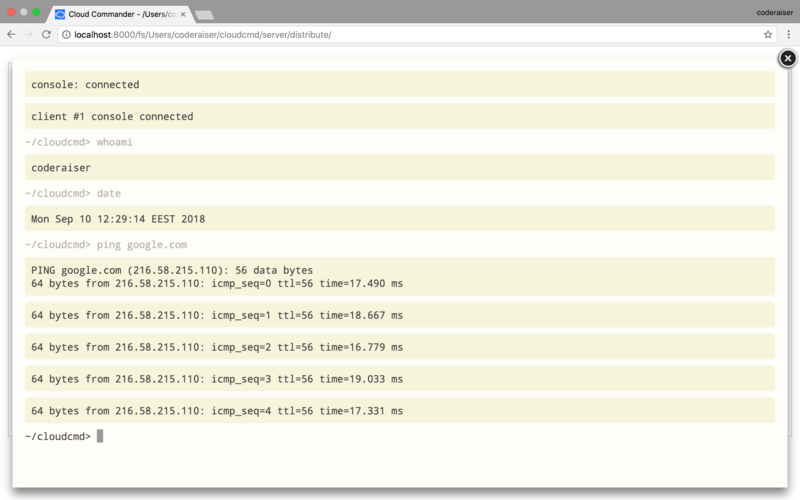 Cloud Commander can be easily deployed to Heroku. Configuration will be read from the home directory, the host’s root file system will be mounted to /mnt/fs, and port 8000 port will exposed to the host’s port. Dropbox support is integrated into Cloud Commander, and you can switch from your local file system to a Dropbox account. All you need to do is set --dropbox option and generate a dropbox token for your account. Olena Zalitok for logo and favicon.